Diogenes, I like this system and I'm looking for a more conservative style of trading for the new year, as in getting out of options on a regular basis (spreads and theta too tough). If I may ask a few questions, I'm trying to figure out how you take some signals and pass on others. I know there has been some whipsaw the last couple months, and since the trend has been up, maybe that is a filter to just trade the long side. Anyway I drew up a chart with "apparent to me" signals to short with NYMO down and NYSI also. Just wondering why you did not take these. The first 2 may have worked but alot of drawdown, next 2 were false. It looks like there needs to be 2 consecutive NYMO down days to be a "safe" sell (prior to the period of false breaks). Do you have a set of mechanical rules or is it more subjective ? CLK, Your "apparent to me" signals are correct. Those were invitations to short the market. So why not do it? First (and on the longest term I'd consider), we are in a bull market; second, once that deeply oversold dip in the NYMO in late October/early November is in place one has to believe the market is ready to rally; and finally, once the NYSI starts to rise the bullish swing has begun. As I've suggested before, the NYSI is context (since it tends to lag, context is an important word) for which side to play the market -- that is, if it is rising go long, buy the dips, etc., in whatever trading product one is comfortable with, and if it is falling, go short, sell the rallies, etc... In other words, as you noted here, the current trend is up so, yes, that is the filter to trade only the long side. As far I'm concerned, it's awfully easy to get into trouble fighting the McClellan with shorts when the NYMO and the NYSI are overall bullish. There will be plenty of time to make money on the short swing when the NYSI is declining, although even then you have to guard against those short trades blowing up in your face (even with a NYSI down turn, it is still a bull market). It should be noted, however, this swing has been tricky from the beginning because of the frequent whipsaws in the NYSI but as long as that October/November dip in NYMO held, the swing was likely to play out to the long side and it has. So those signals to short you marked were to my mind less invitations to short and instead signals to take profits on longs. Hope that helps. Good trading to you. P.S. If you prefer options you might want to trade them only in this context. I just looked up the Russell Jan 610 (at the money) calls on that last up swing in the NYMO from Dec 18 to Dec 28 -- they went from 16.20 to 27.75. NYSI appears to have put in a hook (hooks are usually a sign of acceleration in the direction of the previous trend -- in this case, up)..
Reloaded and ready to play defense (rally is getting old - eight weeks from NYMO bottom). 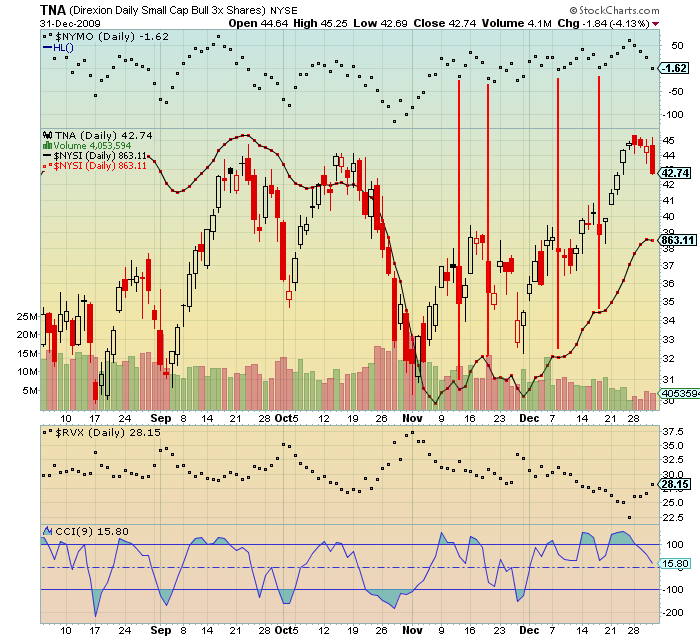 Lightened up on TNA today on the downturn in the NYMO. NYSI, RVX, CCI still on a buy (see above charts). TNA up only 1.5 percent on this swing so far. Not much of a trade and lagging badly given what's going on in some of the sectors -- DGP up 5.2 percent, ERX 6 percent, GDX up 4.9 percent, KOL up 5.6 percent, MOO up 5.4 percent, SLX up 4.5 percent, TAN, up 6.7 percent, and UYM up 4.9 percent. This NYMO swing was five days -- in other words, it appears all one needs to swing with this bull is an excuse to buy something and the NYMO/NYSI direction might be the best excuse there is. That TNA is lagging so much and NYMO has put in a high below a high (and NAMO has put in a couple of highs below highs) and given how long the NYSI rally has gone on (about 43 days from the first upturn on 11/9. we could easily have a quick drop to relieve the tension on the tape (like maybe...tomorrow ). Good trading to everyone. What do you know? Got the quick drop. Today's a pretty good example of holding tight stops and not staying too long at the fair when swing trading. TNA has given up the anemic 1.5 percent it was up on yesterday's NYMO turn-down and is down 2.5 percent more. A ETF basket I follow -- including BGU, DGP, ERX, KOL, MOO, SLX, TAN, UYM -- was up 6.2 percent on yesterday NYMO turn-down and is now up 1.6 percent. The NYSI is flirting with the zero line (at this exact moment I have it at negative one in Trade Station). If it's down at the close, it will be a sell signal. And the Russell Vix (RVX) is up -- another sell signal. And the CCI is plunging from overbought -- another sell. As they say, what goes up also goes down. I see what you see and I'm not so sure. This was the first notch in the long NYSI run up from early NOvember. One notch down doesn't necessarily trigger a sell. Last time we had this set up was end of first week in August. We rebounded sharply over the next 2 days and then swooned for a few days only to recover to new highs TWICE before NYSI completely rolled over. I have no way of knowing if history is going to repeat itself exactly, but as you know, I ONLY trade off NYSI ( and have done so daily since 1985), so I am used to looking at its patterns. I have a couple of preliminary charts with explanations on my blog (link below) if you want to see what I'm thinking. BTW, I love your posts. I'm not so sure either. Never am. But I'm always trying to keep it simple here and get the context to be long or short correct (at one time I had fourteen indicators just to prove to myself the NYMO and NYSI were right). One notch does trigger a sell for me and then I wait and see if there's follow through, just as one notch can trigger a buy. Right now I am flat (avoiding the short side because this bull rages rapidly), but if the NYSI turns up again tomorrow, I will play the long side again quickly. In fact, I'll be watching to tomorrow's open closely (it appears at the moment that the holiday futures are firm), going at least partially long intraday if the real-time NYSI/NYMO and the price action warrants it. Checked the charts on you blog again (I do that regularly and would recommend everyone do the same) and I see almost none of your supporting indicators agree with the NYSI notch down as a sell and that is what it is and I wouldn't argue with any of them. I'm just going to wait and see here. I'd like to tap your experience if I can. It has been my experience that the NYMO and NYSI take a plunge in the tenth to twelfth week after the last NYMO bottom. That usually happens like clockwork, except occasionally (maybe I should say, infrequently) that cycle extends to sixteen weeks. By my count, we're in the eleventh week from the late October NYMO bottom and the early November NYSI up turn, which was in my mind a reason to respect this NYSI dip as a sell. I'd appreciate any thoughts you might have about this. NYSI turned up again. Looks like maineman called it here. Nicely done. The context is once again to play the long side until it turns down again. A couple of cautionary notes: This rally has gone on for 48 days, nearly ten weeks of trading days -- that is, as they say, usually all she wrote. There is a lower low from Friday and declining highs on the NYMO as TNA and other long ETFs continue to slog upwards -- that is, as they say, a shot across the bow. Still, it's a bull market and it can keep going up as long as it wants to keep going up. Good trading to everyone.